Nevner hvordan pusten har sammenheng med smerter, spesielt i nakke, og beskriver normal vs abnormal pustefunksjon. * Bio-mechanical factors such as rib head fixations or classical upper/lower crossed patterns of muscle imbalance. * Biochemical factors involving anything that affects the body’s delicate pH balance including allergy, infection, poor diet, hormonal influences or kidney dysfunction. 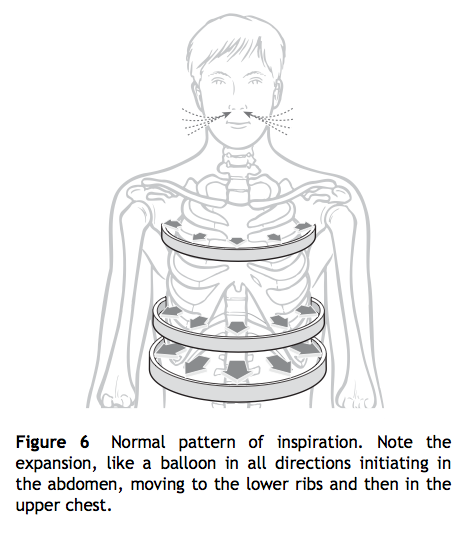 Initiate in the abdomen, which would expand outward during inhalation and inward during exhalation. Have some degree of horizontal lower rib motion (even if slight). Have no lifting up motion in the upper ribs. «But why is the relationship between faulty breathing and neck pain so pervasive? Dette innlegget ble publisert i Forskning og artikler og merket med Pustemønster, Pustemuskler, Smerte. Bokmerk permalenken.